In Travelcom Network, all our flight tickets are primarily insured by the airlines. However should any of our customers decide to take up extra insurance packages, we have assembled and partnered with strong and well experience insurance firms within and outside Nigeria for quick and robust insurance packages that are tailored towards your need. Let us know what you want and we will design a package for it to suit your desires. The rules vary depending on the airline and may also apply to baggage packing. A hand luggage only is allowed that generally can have a maximum weight of 5 kg, the sum of the sides must not exceed 115 cm (eg 55x40x20 cm). 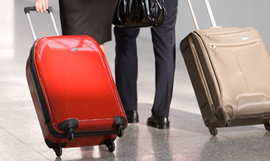 … At the destination airport, you can collect this type of baggage from a special area. To ensure your security, all travelers are required to undergo screening. However, there is a screening procedure for children who appear to be 12 years old and younger. Officers will consult parents or the traveling guardian about the best way to relieve any concerns during the screening of a child. 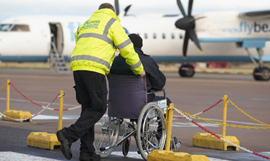 Where a disabled or reduced mobility passenger is travelling with an accompanying adult, we will do our best to ensure the accompanying passenger is seated next to them. The able-bodied accompanying adult can’t assist more than one reduced mobility passenger and must purchase the prevailing adult fare.